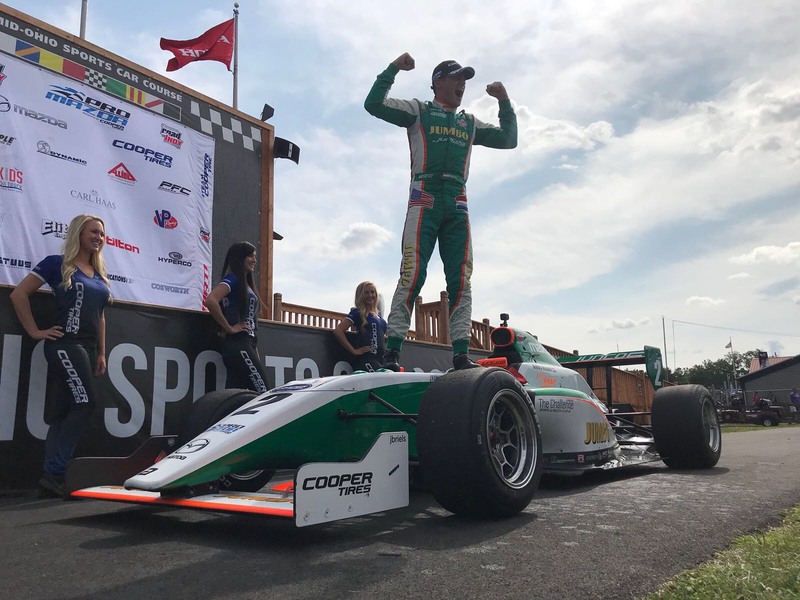 Rinus VeeKay has reclaimed the Pro Mazda Championship Presented by Cooper Tires points lead after winning Rounds 12 and 13 at the Mid-Ohio Sports Car Course, completing the weekend sweep and taking his 2018 season win tally to a total of six. The 17-year-old KNAF Talent First driver from Hoofddorp, Netherlands now has a 31-point advantage as the series travels to the 1.5-mile oval, Gateway Motorsports Park, for the penultimate round of the 2018 season. In qualifying for Race 1, VeeKay earned a championship point from his track-record pole position lap, leading the field to the green flag on Saturday afternoon. VeeKay went on to dominate the 25-lap race, which was unaffected by full-course yellows, to take victory by almost three seconds over David Malukas. Starting second for Sunday’s race, VeeKay would inherit the lead after David Malukas suffered a mechanical failure on Lap 8. Despite a full-course yellow with four laps remaining, VeeKay remained flawless on the restart to fend off pressure from his Juncos Racing teammate, Robert Megennis and Oliver Askew. The win completed back-to-back weekend sweeps, marking four straight wins for VeeKay and extending his championship lead to 31 points over Canadian Parker Thompson. The Pro Mazda Championship will next square off in Madison, Ill. at Gateway Motorsports Park, August 24-25. You can watch the 55-lap event live on the Road to Indy app and RoadToIndy.TV. For the latest news and updates, follow @FollowRVK on Instagram, Facebook and Twitter.